Neem oil benefits are many and varied. Using neem offers both health benefits and environmental benefits. What are the biggest neem benefits? Think I'm kidding? I'm not. Ok, I may be simplifying and exaggerating a bit... But read on. 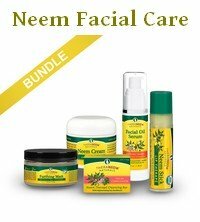 The benefits of neem trees and neem oil are many and varied, and they are not all obvious. It soothes itchines, redness and irritation. It improves general skin health and immunity, combating bacterial infections, as in acne, boils and ulcers. But neem doesn't promote resistance in bacteria. Antibiotics are over-prescribed and are becoming blunt as a weapon in our fight against diseases. Neem is an interesting alternative, and one that will never stop working. Nobody wants to douse themselves in insecticides, or use corticosteroids forever. Neem can often do the same job, even better. 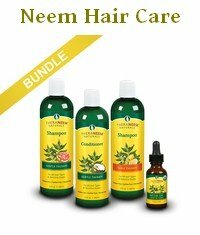 Used as hair oil neem promotes shiny, healthy hair, combats dryness, prevents premature graying and may even help with some forms of hair loss. Neem oil also makes a great nail oil. No more brittle nails and no more nail fungus. The biggest benefit of neem oil and neem leaf is that they are good for your general health, the condition of your skin and body, and your immune system. So whether you use them to fight some skin condition, or just to prevent any skin related problems in the first place, you are doing yourself something good. Neem leaf is an essential ingredient in many Ayurvedic remedies. 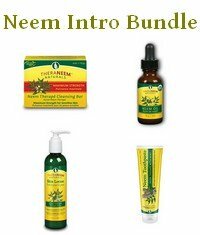 Indians have known for thousands of years that taking neem has many benefits. It stimulates the immune system, improves liver function, detoxifies the blood, generally promotes a healthy circulative, respiratory and digestive system. It is famous as a malaria treatment and for diabetes. In the Western world people mostly drink neem tea or take neem capsules to boost immune function and for the blood cleansing effect, especially people with skin problems. Yes, spermicidal. Neem even has potential as a natural means of birth control. Amazing, isn't it? Oh, and oral care and periodontal disease is a big one, too. You can't beat neem when it comes to caring for your teeth and gums. 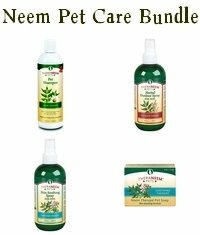 Neem is just as fantastic for the skin and hair of your pets as it is for yourself. Again, you avoid nasty chemicals and harmful medications. They only increase stress for the immune system rather than helping it, whereas neem benefits the immune system and overall health of your pet. Spraying neem does not create a death zone around your vegetable patch or orchard, like other insecticides do. These days you never know what kind of chemical cocktail you eat with your bought fruit and vegetables. 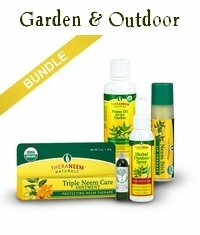 Neem protects your garden crops from chewing and sucking insects and from fungal diseases, and your health benefits as well. Another neem benefit is that insects do not become resistant to it. Normal synthetic insecticides create resistant insects. So farmers need to spray more and more, and nastier and nastier chemicals to keep insects in check. When you use neem oil you don't have that problem. Neem oil spray can also be used as a natural mosquito repellant. Neem keeps mosquitoes away AND it is good for your skin! On the other hand DEET, the active ingredient in chemical insect repellents, is highly toxic. And there are more neem benefits. Growing neem trees takes little water. Their deep tap roots break through hard clay pans and mine the subsoil for nutrients. The nutrients are returned to the surface as leaf litter, for other plants to use. Neem trees are especially good at accumulating calcium. Growing neem trees can bring acidic soils back to neutral and so reclaim exploited soils. Neem trees can grow in very marginal areas, and improve those soils over time. Increasing use of neem in the Western world, and increasing demand, would open up economic opportunities in third world countries. Those countries have the ideal climate for growing neem. Neem grows quickly and makes good firewood. Excessive firewood clearing is the main reason for the spread of the desert. And we all know that trees are carbon sinks, and that we need to contain our carbon emissions if we want to slow global warming, and the more trees we plant the better. After reading all this, do you wonder why the world still knows so little about the benefits of neem? Is it all too good to be true? Well, no, it's not. It is all true. But there is one key benefit that neem can't offer. It may be great for all of us, and great for poorer countries, but neem would not put big money into the pockets of the Western pharmaceutical giants. US companies tried to obtain patents for neem, and the patents were revoked. Without patents and monopolies there is no money in neem for the pharma giants, so they will not fund the necessary research. A cheap, safe, effective and easily available natural drug is AGAINST their interests. Research is very expensive, but without that big scale research authorities like the US Food and Drug Administration or the Environmental Protection Authority are unable to give neem their ok. Anybody who is selling neem is not even allowed to say any of the things that I said above, and many other things I write on this website. Here's a tree that could very well solve some of the world's biggest problems, but because the pharma giants can't own it we will likely just continue on the same destructive path.